I asked Pandyboy, Beall Tool Company and rebornpipes about pipe tools and I want members to check my list of pipe tools for what to add, remove or replace with better tools. What is the best wood lining for pipes (and tray layout for customising case)? For cigars, I am definitely go with Spanish Cedar but it does not match with pipe tobacco since it absorbs other smells. Also, what is the best place to buy motors for bench grinding (looking for 1/3 HP 1725 RPM 220 V 56 Frame Motor)? Last edited by Cigar & Pipe Connoisseur; 06-05-2018 at 04:08. That's some list, Kim! I can't help you out on the buffing equipment, but I'm sure there are members here who will. I take it that you like Mark Tinsky's pipes? As for the tobacco tin ashtray and cork knocker, I'm with you there. I use the same thing for ashtrays. They're simple, cheap, and do the job just fine. To me, Tinsky's pipes are great looking custom briar pipes to me (cheap yet wonderful as Dunhill's). Agree with you that using empty pipe tobacco tin as ashtray with cork knocker does a job as same as ashtray but cheaper (FOH member who also smokes pipes recommended me to do that ). I appreciate your enthusiasm, Kim, but in my opinion, you are trying to get in far too deeply for someone that has never even tried a pipe. My advice would be to keep things simple at first and let your experience guide you as you progress. For myself, I started pipe smoking with two corn cob pipes, two packs of pipe cleaners, a disposable lighter, a Czech tool, and three tobaccos. That's it. So, I've revised your list with my advice below. Anything that will keep the pipe from tipping over when you put it down. Metal, plastic, wood,.. doesn't matter. Are you planning to start refurbishing estate pipes? If so, do you plan to do this as a hobby? Do you have any previous experience with antiques (cleaning, refinishing, polishing, etc.)? Do you need a storage case for your home or is this something that you will be taking with you on the road? Do you frequently travel? If so, how long is a typical trip? I'm at the other end of the scale from what you are planning Kim. All I have is a few Falcon/Alco pipes and a couple of briars, a Swiss Army knife, a few cheap clipper lighters, some mason jars plus some pipe cleaners when I can get them....and that's about it. Forgot to say that I would stick with corn cob pipes for at least six months as beginning!! I am considering pipe as hobby alongside with cigars and will move deeper after get used to pipes with corn cobs. For pipe case, I am just using idea from my cigar project (travel cigar case). That's a great list and some great answers. For cobs I would recommend anything with a hardwood plug. They're a tad bit higher in price but we're only talking a couple of bucks. Something like a Country Gent or Diplomat, which come in different shapes. I like the Apples. With a hardwood plug I find the bottom of the bowl stays dryer and doesn't get that soggy bottom. Cork knockers are great, but the palm of your hand works just as well and has the upside of always being at your side. For a tamper you could always use a nail or a golf tee. I have a Czech tool but it stays on the cabinet mostly, and the little spoon comes in handy for opening tins. I always have a pocket knife and a golf tee in my pocket. My advice is to not go overboard on pipes and accessories to start with, but explore the different types of tobacco first. The pipes and accessories won't be going away any time soon. Who knows about the baccy. I have two Mark Tinsky pipes. Got this one a few years ago for Father's Day. I'm sorry, Kim. My question was unclear. I was asking if you plan to refurbish estate pipes as a hobby/business. If not, all of the buffing equipment is completely unnecessary for routine maintenance. The majority of the gentlemen here don't have one. 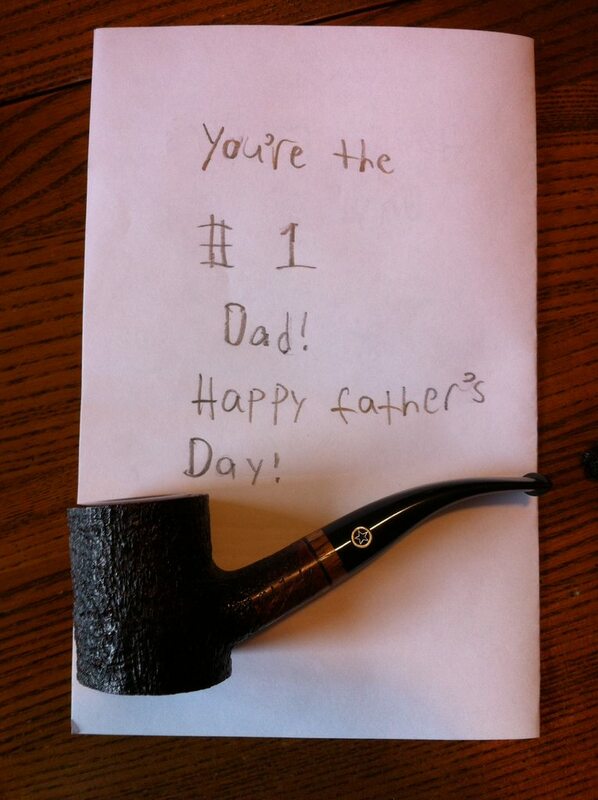 In fact, most of the guys here don't have half of what you've listed and they've been smoking a pipe for decades. Even if you are planning to refurbish estate pipes, I would still advise against a buffer at first unless you have some wood working, machining or antique restoration experience. The single most common type of damage that I see in "restored" pipes was caused by improper and overzealous buffing. When you're starting out, it's best to stay away from anything with a motor. Learn to work by hand to get the feel for it before you invest in power tools. As for the case, if it's for travel, then you certainly want a soft liner like foam. You don't want the pipes rattling around in wooden containers. They'll only get scuffed and chipped. That's a good plan until you find out first what tobaccos you like and second the types of pipes you would like. Buy 3 or 4 tobaccos of different blends. You will find that very few pipe tobaccos taste like cigars. I think when you get started you may even reduce your cigar consumption when you discover the broad spectrum of pipe flavours.